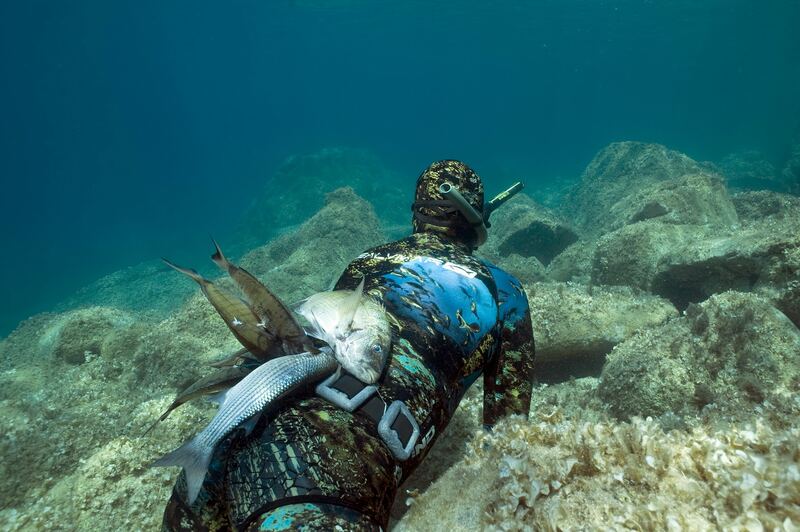 The Blend spearfishing wetsuit strikes the market and is immediately recognizable for its amazing and innovative camouflage. 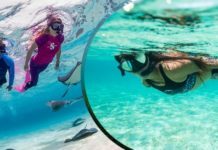 The top of the line new wetsuit positions itself above the NAT and Next wetsuits, already on the market, and that will continue to be sold as more affordable products. 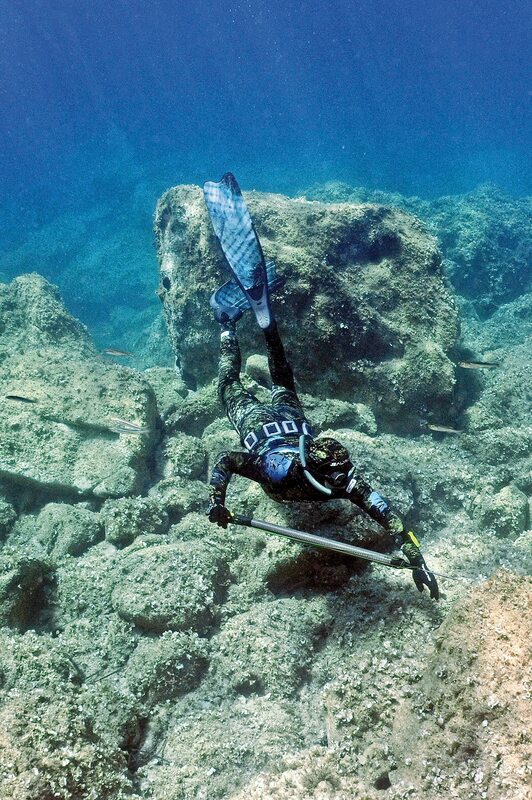 The new design has been obtained using a photographic printing method that permits to have an astonishing seabed image on the wetsuit. Rocks, corals, amazing blue of the sea water and even small fishes are present on the 10 colours print of the new Blend. To improve quality of the camouflage, insuring the perfect image even when the neoprene is stretched, the external lining is made of Nylon, which does not become white as Lycra when the tissues are pulled. The open cell interior and lining exterior neoprene used by Salvimar is the first quality Nam Liong 3D material, where 3D indicates the capacity, guaranteed by the producer, to stand pressure up to 4 atm, meaning 30 meters of depth, without losing its elastic characteristics. All edges of wrists, ankles and face contour are refined with the neoprene forded once and sewed, giving this area a strength that avoids the loss of elasticity along time, which would result in a strong reduction of watertight effect. Moreover, keeping the lining external in these areas means that protection of the neoprene from sunlight is much stronger, for a longer lasting wetsuit. 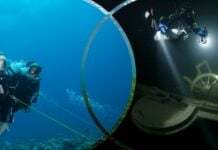 In particular, the face area is well designed and shaped to best fit every diver and give maximum comfort, together with great watertight effect. The preformed shape is also applied, in addition to the face contour, to the legs and arms, while the entire figure has ergo-fit construction to better adhere to the spearo’s body. Sternal protection and construction is of top level, with an internal 3.5 mm thick neoprene sheet that protects the sternum from the force generated when loading the speargun. The internal solution gives better external look to the wetsuit, but mostly avoids breaking of the gluing of the sheet from the wetsuit. To avoid slipping of the gun from the chest during loading phase, this area is covered with a polyurethane fragmented cover, called “Puffgum”. The fragmentation is used to keep the area sufficiently soft and elastic. Same solution applies to elbows, knees and bottom. The latter also helps to avoid slipping, for example, when sitting on the tubular of a rubber dinghy. Puffgum is extremely resistant from wear and puncture. The trousers of the Blend have the traditional Salvimar solution with high waist, always extremely useful to better insulate the diver, while the closing of the lower part of the jacket is with two clips for best tightening and sealing of this critical area. 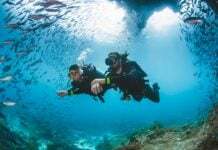 In addition, the two clips can be and must be adjusted at best to have the jacket well lowered on the diver’s waist. Jacket is available in thicknesses of 3.5, 5.5 and 7 mm, while trousers are available in 3.5 and 5 mm. For best flexibility and choice by the customer, it is possible, excluding the 3.5 jacket and trousers, to buy separately the upper and lower part of the wetsuit.